The Citrus Research Board and UC Agriculture and Natural Resources have established a $1 million endowment to fund the Presidential Researcher for Sustainable Citrus Clonal Protection at the UC Lindcove Research and Extension Center. 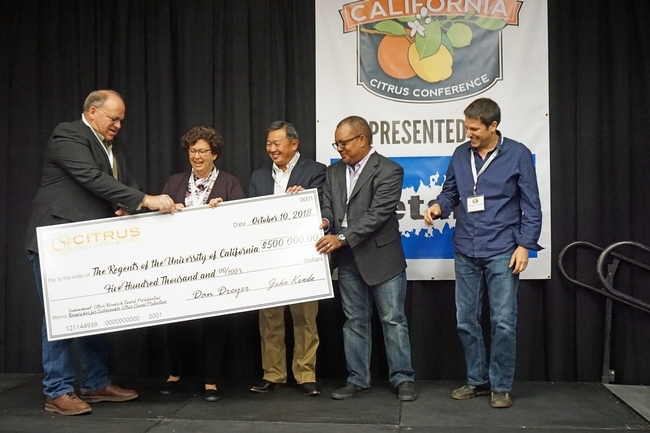 The endowed researcher will provide a UC Cooperative Extension scientist a dedicated source of funds to support scholarly activities focused on the long-term sustainability of the citrus industry. UC President Janet Napolitano provided half the funds for the endowed researcher; the CRB donated the other half. CRB chairman Dave Dreyer presents a giant check to UC Agriculture and Natural Resources representatives, left to right, LREC director Beth Grafton-Cardwell, associate vice president Tu Tran, UC ANR director of major gifts Greg Gibbs, and UCCE plant pathology specialist Georgios Vidalakis. The new endowment supports the UC Citrus Clonal Protection Program, which distributes pathogen-tested, true-to-type citrus budwood to nurseries, farmers and the public to propagate citrus trees for commercial and personal use. The CCPP maintains blocks of trees that serve as the primary source of budwood for all important fruit and rootstock varieties for California's citrus industry and researchers. The CCPP is a cooperative program between UC ANR, CRB, the California Citrus Nursery Board and the California Department of Food and Agriculture. CCPP director Georgios Vidalakis, UC Cooperative Extension specialist in plant pathology at UC Riverside, shared his appreciation for the efforts that led to the creation of the new endowed researcher position. A selection committee will award the endowment to a distinguished UC ANR academic. An annual payout will be used to provide salary, graduate student and/or program support. The researcher will be named for a five-year term. At the end of that period, the appointment will be reviewed and either renewed or taken back to a selection committee to choose another UC ANR academic. “I would like to thank the CRB for this generous gift and their continued support of our research for CCPP at the LREC,” said UC ANR Director of Major Gifts Greg Gibbs. The CRB administers the California Citrus Research Program, the grower-funded and grower-directed program established in 1968 under the California Marketing Act as the mechanism enabling the state's citrus producers to sponsor and support needed research. More information about the Citrus Research Board may be found at www.citrusresearch.org.